Here is another awesome probiotic beverage. Fruit kvass is usually a bit sweeter and less astringent than kombucha, so if you are looking for an alternative, give fruit kvass a try! Put ingredients in jar, fill with water leaving 1 inch at top. Sit in room temperature 2-3 days. It will last in fridge a few weeks. Drink a couple ounces a day, or start off smaller. *Kvass can be made with any fruit combo, vegetable combo or fruit and vegetable combo. Experiment! It’s been around for more than 2,000 years and has a rich anecdotal history of health benefits like preventing and fighting cancer, arthritis, and other degenerative diseases. Most importantly, though, it is an incredible source of probiotics. Kombucha is made from sweetened tea that’s been fermented by a symbiotic colony of bacteria and yeast called a S.C.O.B.Y. A scoby is also referred to as the “mother” because of its ability to reproduce, or the “mushroom” because frankly it looks like a giant mushroom head. Kombucha didn’t gain prominence in the West until recently. Kombucha: a fermented tea filled with good-for-your-tummy probiotics. Brew tea bags/loose leaf tea with 8 cups of water for 20 minutes. Strain tea and add sugar. Stir until dissolved. Add remaining 8 cups of cold water. Once cool, add the sweet tea to a large glass container. Add the starter liquid (or apple cider vinegar) to the glass container. Place the scoby in the container. **Make sure that the tea is cool before adding the scoby, or else you may kill the culture** Cover the container with a towel and secure it. Let it sit for 5-14 days, depending on personal taste, at room temperature. You can begin checking it after a few days to see when it gets to your ideal level of sweet/astringent. Take heart kombucha newbies: kombucha is a fermented beverage so it has an astringent, vinegar taste to it. It can be an acquired taste. 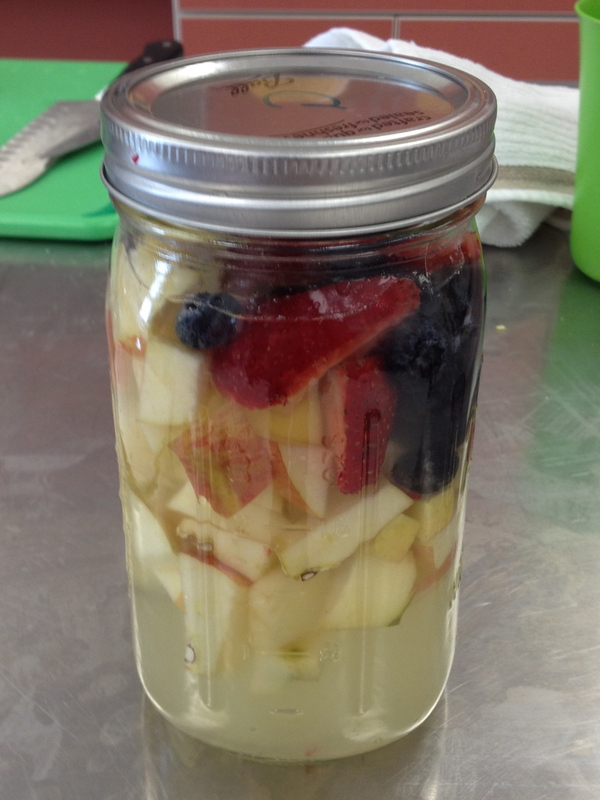 You can jazz up your kombucha by adding fruit juice, fruit pieces, ginger, chia seeds etc. Adding fruit will make it sweeter and less astringent. Every time you make a new batch of kombucha, a new scoby will form and old ones will get thicker. You can let each new scoby thicken up through multiple batches or separate them immediately. It's a good idea to save an extra culture as a spare, but then pass on extras to a friend! Keep spares in a glass container with a cup of kombucha liquid in the refrigerator.